Exploring space is a dangerous endeavour. We know this; we’ve lived through concrete examples of it. The Challenger shuttle explosion in 1986, which killed all seven astronauts. The destruction of the Columbia shuttle upon atmospheric re-entry in 2003, which again killed all seven of its crew. We’re only at the very beginning of our colonisation of space, and already there’s a body count. Space is dangerous. It’s not an environment we’ve adapted for, and the presence of planets or other solid bodies doesn’t necessarily make things easier. Simon Petrie’s depiction of the colonisation of Titan is a case in point. One of Saturn’s moons, possessing an atmosphere and surface liquid, it’s nonetheless a frigid, dim, and poisonous environment that can’t be survived without artificial assistance. Contained colony structures exist for the population, and all-encompassing suits do for the individual when they have to leave the safety of the habitats and expose themselves to the moon’s natural state. The smallest leak in either means death. “Titan has so many ways to kill,” thinks one character, Guerline, dangling from a cliff and in danger on a rescue mission of her own. “By cold, by asphyxiation, by toxicity, and even, it would seem, by gravity” (p. 113; all page numbers are taken from the epub edition). This is an environment that kills not only individuals but entire settlements. Another character, Åke, recalling the accident that killed his father, is under no illusions as to any guarantees of life in this hideous landscape. Titan, let’s be honest, is a frozen hellhole of a place. Yet the danger must compensate in some way for the claustrophobia of landscape, for Petrie’s imagining of Titan has it inhabited by a significant population. (An exact number’s never given, but the impression I got was of humans in the tens of thousands, with numerous and often competing settlements). And the danger here is emphasised again and again. Wide Brown Land is a collection of interconnected short stories. Some characters only appear once; some appear several times. Some of the stories are entirely contained, as for example “Placenta,” when the 34-week pregnant Tiril is out photographing the ruins of a deserted habitat when her environmental suit fails, and she’s forced to find a method of ridding herself—and her foetus—of carbon dioxide before the build-up of such kills them both. Alternately, some stories end on what are essentially cliff-hangers. There’s no follow-up to the conflict depicted in “Phlashback” between Teresa Maria, her nephew Cory, and his lover Arum after the latter betrays them to pharmhand drug-smugglers, and where the only escape route out of the subsequent fire-fight appears to hold two at most. Likewise, there’s no resolution to young Kalpana’s story in “Hatchway,” which leaves her deliberately locked out of habitat without a suit and only small and failing protection. Kalpana’s determination to cheat death and confront her would-be murderer gives readers a sense of hope and optimism on her behalf, but there’s no guarantee she actually makes it. In fact, given the high death count in this collection, the odds are genuinely against her. It’s a risky technique that Petrie’s using here, a determined reliance on ambivalence and lack-endings, and how successful he is at it will I think depend, as such things often do, on the tolerance of the reader. Personally I like this sort of ambivalence in stories, so this worked for me—but there’s no getting around the fact that it’s a brave choice on his part. It’s also a choice that resonates with theme, and this makes me suspect that it’s very carefully deliberate. I said above that this collection has a high death count. It does. In most of the stories someone dies. Sometimes they’re killed by other people; more often they’re killed by environment. The two are linked. Titan is a dangerous place, after all, and what this means is that it necessarily attracts people who are interested in danger. Granted, this doesn’t always hold—individuals who choose to colonise a place such as Titan are one thing, but those born on the planet to existing colonists have rather less choice in the matter. And for all Wide Brown Land is primarily interested in the conflict between individual and environment, it has rather less to say on immigration (or emigration, for that matter). The bulk of the industry appears to be related to mining, which as we know from Earth is not exactly the most risk-free professional endeavour. Suffice to say: danger abounds, and the colonists of Titan are so used to this ever-present risk they’re almost cavalier about it. Tiril goes off to photograph distant ruins on her own, for instance. Perhaps I’m just used to the health and safety obsession of the modern day university, which was never happy about me going alone to a popular beach for fieldwork, for instance, clearly afraid that while looking at seagrass I’d be pulled to my death by a freak wave or some such. But beach-walking is a low-risk activity. What Tiril’s doing isn’t—but it’s seemingly normalised in her environment, so clearly risk-assessment is a different beast on Titan. Life in a lethal environment requires sacrifices that are difficult and costly. They can, even, be sacrifices of other people. Is it any wonder, then, that the individuals drawn to this type of life may tend to isolation by choice? Community may be a safety net, but it can also be a burden; emotional attachment becomes a high-risk endeavour in an environment characterised by sudden and frequent loss. In a population where interpersonal bonds come with a real shading of ambivalence, is it any surprise to learn that “Titan was beginning to acquire a reputation as the ‘murder capital’ of the outer Solar System” (p. 68)? Death is everywhere here. It’s a function of the isolation that life on Titan inflicts, the compromises it demands. To be honest, part of me wonders if this tendency to depict death and murder (one or the other is present in nearly every story) borders a little on the repetitive. I understand the thinking behind it—the desire to emphasise danger, the absolute alien environment—and I understand too how this plays into Petrie’s choice of presentation. While every story in Wide Brown Land has its own narrative arc, there are some, as I said above, that appear cut off prematurely. But this is understandable if one considers the theme of the collection not as death or Titan but isolation. These people are isolated from a nurturing environment. They’re in many ways, both by nature and by nurture, isolated from each other. And through his choice of structure, Petrie invites the reader to share that isolation. We don’t know what happens to Kalpana, or to Arum. We’ll never know. They exist as distinct from us, the readers, and that their stories end (for us) so abruptly makes us feel even more distant from them, as if part of us simply doesn’t connect—is incapable, even, of connecting. I know that after reading the first few stories I was aware of a sort of pulling back within myself, a sort of don’t-bother-getting-attached-they’re-probably-going-to-die feeling which genuinely does more to mimic the isolation of living on Titan, I think, than any number of striking passages describing landscape. Yet for all that danger and death informs the isolation present in every story here, the most effective of the stories involved neither of these signposts. In “Emptying Roesler,” attempts are made to evict an elderly man from a deserted habitat. Xu argues that he can’t leave—his daughter, who has been missing for years, might one day return and this is the only place she’ll know to find him. He’s eventually forced out when his home is fired around him by the eviction agent Niall, but not before we discover that his daughter’s possibly not missing after all. There’s an outlaw group of pharmhands running a drug operation within the distant bowels of the habitat, all unknown to Xu, and the “tall dark woman” (p. 77) seen with them by Niall, might be his daughter—and if so, she doesn’t care about her dad enough to even let him know she’s alive. This is a quietly painful disintegration of social bonds and family, one underlined by Niall’s action in lighting the fire in the first place. He doesn’t do it to evict Xu, not really. He wants to get back at the pharmhands, because their actions seriously injured his wife: “she wasn’t the same person, afterwards. 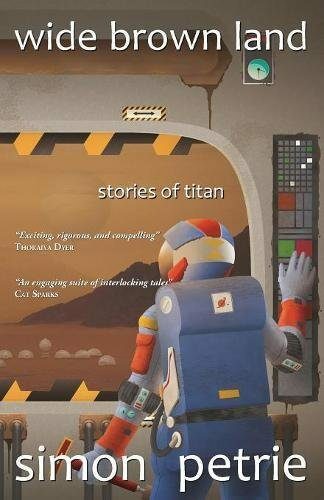 She could never be the same person; she’d lost too much, in those crucial moments of oxygen starvation” (p. 66), in the failure of systems designed to protect the human animal from Titan. But colonisation, that deliberate leaving behind of home planet, that chosen isolation from kin and kind, is not kind, and there’s very little that anyone, in the end, can do against the looming danger that is Titan. The moon is too awful, and it is too alone.